oh my gawd. . this is beautiful. . even the second photo. . this is like Valentine's Day dinner worthy! and I love that you actually met and had dinner with Isabel . . so cool! Valentine's Day dinner? You're humoring me, right? I do this on a regular weeknight. This looks like a wonderful dish! I have always liked tarragon, but I'm starting to really love the flavors lately so I can imagine scooping up the rest of this sauce with the chicken. How yummy! And I definitely think you did a great job in improving your presentation from the previous post - awesome! What a gorgeous recipe that my family will love. It was such an honor to break bread with you when I was in San Francisco last year! I loved meeting your family. Thank you for all your help and support with the Sunday Supper Movement. What a gorgeous gourmet meal!!! Isn't it a shocker to look back at our early food photos? You've come leaps and bounds...and always share such wonderful recipes with the SS group! That is one beautiful dish, DB. I would expect to be served this in a fine dining establishment and would be thrilled when it arrived at the table. The new photo may indeed be prettier, but I would love to sit in front of that old one with a big spoon and sup that sauce. Divine, either way! Beautiful presentation! And it sounds like a gourmet meal - great recipe! Yes, much better presentation this time around. A tarragon cream sauce is one of my favorites and I think it would go splendid with fish also. 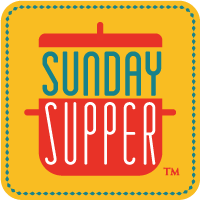 I'm glad you have joined in with Sunday Supper and I very much enjoy your participation and humor (and recipes too). How simply divine looking, so gourmet!! Such a lovely presentation, Happy #SundaySupper!!! It is so much fun to go back and see how far we have come individually and as a community. What a perfect dish for #SundaySupper 's birthday! Simple and easy! And your final photo is great! Yes hands down the photo looks better but I don't care which plate you give me as long as I get one because this dish sounds delicious. Your dish looks gorgeous! !I love the creamy sauce with tarragon and the recipe sounds amazing!Its been a pleasure cooking with you!